The Results: Does a beer glass really affect flavour? 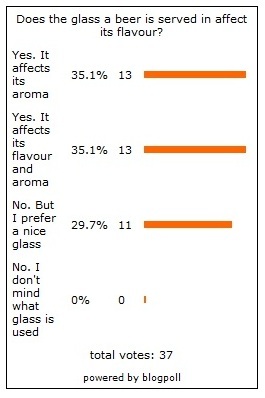 I ran a poll last week about whether the glass a beer is served in really affects its flavour or aroma, or both. I purposefully didn't say what I thought as I didn't want to lead people into voting in a certain way. The results, as you can see on the left, were really interesting. Not one person voted for "No. I don't mind what glass is used" when asked the question "Does the glass a beer is served in affect its flavour?" This surprised me, but also bolstered my faith in the readers of this blog as a discerning bunch! Also interesting is that there is an even split between the two answers: "Yes. It affects its aroma." and "Yes. It affects its flavour and aroma." With the answer "No. But I prefer a nice glass." Coming close behind. I asked people to put the psychological effects of the glass aside for the survey, but this answer was there for people who thought the only effect of a glass on the drinking experience is psychological. Firstly, this reinforced my view that many people don't think that a fancy glass affects the beer at all, but appreciate the psychological affect a visually appealing glass has on your overall experience of the beer. Branding of course ties into this, and psychologically I prefer drinking a pint of Punk IPA from a branded BrewDog straight sided pint glass rather than a normal, old style nonic pint glass, even though in terms of affect on the beer they are pretty much equal. So on to the important question, which of the answers would I have given? Well first of all, I'm not claiming to be the expert here, or to give a completely difinitive answer. This is very much a discussion and if you agree, or don't, please comment below. That said, I would have voted for "Yes. It affects its flavour and aroma." But I also think that the people who answered "Yes. It affects its aroma." were, strictly speaking also correct. But I'll get to why in a bit, first lets look at what the glass shape physically does to the beer. I believe the shape of a glass mainly affects the beer in two ways: It dictates how the head on the beer forms, and it controls how much of the volatile compounds in the beer escape in the form of aroma. The glass shape can affect how the beers head is formed in a number of ways, take for for example the well known dumpy tulip Duvel glass pictured left: The extreme tulip shape first pushes the bubbles in the head together, forcing any large bubbles to burst but smaller bubbles to pack tighter together, giving a smooth tight head. The shape then opens back up at the top giving the head something to 'sit' on top of, helping the head to stick around. As I mentioned, the glass shape can also effect how much of the volatile compounds in the beer escape as aroma. A wide brimmed glass allows more surface area for the beers aroma to escape, and something like a snifter glass (like a big brandy glass) allows you to swirl the beer to release more of the aroma. It has also been argued that a brandy snifter allows the volatile compounds to escape the beer but then 'traps them' inside the brim which is relatively narrow compared to the main body of the glass. Although I have to say I'm dubious that this is possible. Anyone got a suggestion on this? Ok, so you may be thinking now that the glass just affects how the head is formed and how much aroma is released from the beer, and doesn't affect flavour at all, right? Well, in my opinion, no. Because flavour and aroma are so intrinsically linked that it is impossible to seperate the two when drinking. (Which is why I earlier mentioned that I think both answers 1 and 2 are strictly speaking correct.) Try drinking a beer with a peg on your nose and tell me what it tastes like. Not alot right? What I'm getting at is that as well as smelling the beer before you sip it, the aroma affects how the beer tastes during your sip. The aroma comes in as you breathe, and even circulates through your nasal cavity from the inside as you swallow. The aroma is hugely important to the overall flavour of your beer, and thats why serving your beer in the right glass which will showcase it's flavour is much more than simply branding, or a psycholigcal benefit. It's the way that brewers deliver their vision of what their beer should taste like. So please, respect the glass people! I've tried to keep this as readable and "un-sciencey" as possible, but please if you have any further info feel free to comment below and add to the discussion. Sorry - missed this last time out. I would have answered "No. I don't mind what glass is used". The reason I would have given is that there are so many occasions where I will drink beer out of an "inappropriate" vessel. Late night at a party, if I take a carry out round to mates, if there isn't a clean glass in the house and I'm too lazy to wash one up. A similar debate happened last year about branding - which if applied to certain beers would also cover glass shape. It got a lot of people engaged and somewhat angry about being served beer in the wrong glass (branding) but when pushed on the subject, no one actually said they would send it back. I wonder if the same applies here. If Orval was served in a tulip half pint glass, would people refuse to accept it? Or would they drink it even if the perceived view is that it might affect the aroma and taste? Thanks for commenting chris but I think you may have missed the point a little bit, as the question isnt whether you are willing to use a different glass, but whether you acknowledge the fact the glass does affect the aroma or flavour. Perhaps I should have had another answer which was "Yes. But I don't care what glass is used." I agree with you in that I wouldn't hand back a pint served in the wrong glass - but I both prefer my beer in the right glass for psychological reasons, and because certain glasses can help a beer smell and taste its best. The answers suggest that people believe the right glass presents the beer in the right way. The right way being the way a brewer might have us believe that it should be served to provide the best taste sensation. If you therefore get the wrong glass, are you not getting an inferior product? If that's the case, why would you accept it? The question is: Do you think the glass a beer is served in affects the aroma or flavour? Yes or no - with a few words to qualify your thinking. It's nothing to do with what you deem acceptable in terms of service, or what you would send back. Apologies Neil, I did not realise your comments were restricted solely to the directed questions and that no further conversation could be had. I would hate not to be one of those "discerning" readers of this site (11 of them that voted) - who appear to drink beer in a glass in the same way people pick horses in the grand national. Chris - I was just trying to explain myself better and reading back I don't think my tone is confrontational, although you seem to have taken it that way. I didn't mean to cause offence, if I have then please accept my apologies. All I was trying to find out is what people think a glass does to beer, not peoples personal preferences, or the psychological side of things. Yes most people like a nice glass, but yes most people probably wouldnt send back a beer in the wrong glass. But the thing which I was aiming to find out is if people actually think it affects flavour or aroma. Do you not see what I mean? Personally if I put aesthetics aside I think glass shape definitely affects aroma. Even if aroma and flavour go hand in hand I'm not wholly convinced it affects flavour to any great extent though. I think when push comes to shove my choice of glass for a given type of drink is dictated by the style of the beer rather than a desire to maximise the aromas (that said I'd only ever drink Meantime IPA at home from a large wine glass). Bitters and pale ales I tend to drink from tulips, stouts I like from a straight sided pint glass, milds and porters I prefer from a dimple mug. This is just aesthetics though, if it comes down to getting the best aromas and maybe flavour if it is affected then I guess the old fashioned dimple mug or the oversized wine glass would be best. Newcastle Brown Ale is the only ale I ever chill down in the fridge, this for me is best served out of a pewter tankard as it stays very cold for a long time, it's the only ale I'd ever dream of serving chilled though. The down side of the tankard is you can't see what you're drinking which I think is massively important to the whole experience of drinking a pint, especially with something like a ruby red ale. I had forgotten about this poll. I've just returned from holiday on a Greek Island - not that that is relevant but gives the background to my recent experience. I bought a selection of beers from the local Greek Co-op, and drank them from a typical straight sided fluted heavy handled jug [I borrowed from the bar]. I enjoyed my beers. And bought more from the Greek supermarket. By now the cleaner had returned the beer glass to the bar and my only option was to drink from a Tooth Mug. The beer just wasn't the same - in fact I needed a bigger glass; the Tooth Mug could not hold enough for me to quaff. This unexpected experience confirms for me at least that beer glass really does affect the flavour. i think the glass affects the overall flavour of the beer in the same way that the volume dial affects the track your listening to, and not augments it as an equaliser would (assuming that by flavour we are talking about taste+aroma). the overall flavour of the beer is not affected but instead the intensity is. There is no glass shape that will allow the limonene of a great citrusy beer to outshine any of the other aromatic molecules, or one that would make a wine taste/smell more soft ripe berries. Anon - I think you make some inetresting points, so next time be proud and put your name to them! The glass does effect the head creation and retention, and also how much aroma is released, and this in turn affects the flavour as taste and smell combine to create flavour. Psychological effect is a whooole different ball game though, and I purposely tried to keep this out of the discussion. Stella Artois from a normal nonic pint glass is so much better than Stella from a goblet. FACT.